A little bit of beauty for your weekend. This image looks like an abstract mosaic, maybe a Peter Max print, but it's actually a serious bit of science. 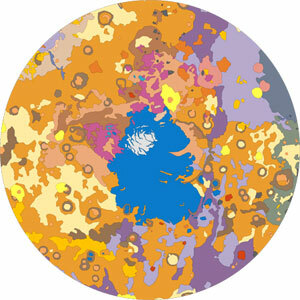 It's a geologic map of the Southern hemisphere of Mars, with the different colors representing the different rock types. This image is just one of a series of renderings of the planets by the USGS Astrogeology Research Program. Their website has high resolution images of several planets and satellites. They are drop-dead gorgeous, with dazzling colors and amazing patterns. Don't want to download the large-format inches right away? The Pruned blog has a collection of the images online.